A lot of you probably have heard of webinars but have not given them a shot yet because you don’t think they are good enough. Well if that’s what you’ve been thinking then we would definitely suggest you to try them once at least. Not only are webinars good for you but also come with several advantages. You should never ignore their value. Want to know what they are? Check out this post! The number one advantage of a webinar is that you don’t have to take the trouble of travelling somewhere in order to get good advice or develop your skills. If it is occurring during the weekend, you don’t even have to do more than wear your favourite pajamas and simply participate. That is really it! So when you are listening to your expert talk and speak about the best ways you can try to take care of your customers, there is a chance you will be put back on the couch with a piece of blanket or something. So yes, you will be learning new stuff without even trying and that is surely good for your career. Unfortunately if you go for good seminars, it will cost you quite a bit of money. But that could also mean that your manager will get paid for the same thing. And if you manage to speak to your boss and convince him that the seminar is going to help your career and his in some way or the other, you could even want to participate during your time at work. This will also show that you care about the company and its people. Do you know what that really means? We can explain it to you! You won’t really have to spend all that time working anymore. Instead you will just sit and listen and get paid for it in return. This is totally a winning situation for you and your boss. Not only that, he will be happy with your work and advice and who knows? You could be promoted again! It does not matter if you have managed to convince your boss to pay up for the webinar, you don’t have to make the mistake of procrastinating and not even telling them about the whole thing. A second benefit added to this point is that you will look like a person who looks forward to improve his career and advance himself. Your boss will really like how you are eager and wistful to learn about new stuff and build new skills and most of your co workers will come up with a note in their mind that you are a go getter. It does not matter if you have a reputation of this sort or not at work, it could always lead to getting new opportunities as well as offers . There are several webinars which tend to go way beyond the standard and passive lecture. They tend to call participants so that they can speak and communicate with one another in some way. This of course can be a great thing. Have you ever heard the adage that the perfect time to look for a good job is when you have been hired? Yes! The statement is really very true. So, you always have to keep searching for the right chance. Till then, you have to change your mind and think of webinars as if they are a great opportunity for you to leave and start networking. Yes! It is very important to step out of your comfort zone and at times when you do this, you have to learn how to survive tough times like this. Times like this also let you know of the different opportunities that are waiting for you. So when you are participating in a webinar, you get to meet and connect with more people. This is where you get to learn new things and keep pushing yourself. In these cases, the key to success in jobs like this is just to stick it out and trying on a regular basis. So that also turns out to be an advantage, don’t you think? Since you are an entrepreneur, I am sure you know that having a good presence online is very important for you. The minute you begin creating new webinars, you will have a new way for people to find you. What you should do in cases like these is put snippets of your old webinars on different sites such as YouTube. For example, you can find a way to find free and easy information to those prospects. You may also repeat the same thing on some podcast site. This will help you turn the webinar into the perfect audio only presentation. Since you are an entrepreneur who is doing webinars, we would suggest you not to make the mistake of being a participant of a webinar only. Also you should attend them on a regular basis so that you can keep learning about the ins as well as the outs of creating webinars and how people can structure them, the number of participants that should be included and how they can be included. There are several entrepreneurs who have the same benefits just like employed people do. This also includes building yourself and improving your skills. But since you are an entrepreneur, you could also make webinars a part of your marketing strategy. You have no idea how helpful that is. You can put yourself out there as if you are an expert on any kind of topic you want to discuss and suddenly those who are attending your webinar begin to understand that you have authority over the subject. It’s that simple! 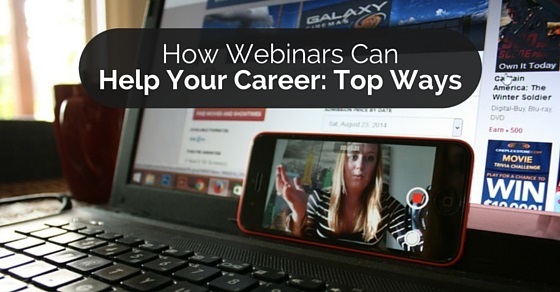 How can you help webinars make the best decision of your life? It could get a little tempting to simply sit down and relax yourself and not write down any notes while attending the webinar. However, there are some issues that come with passive listening. You will get distracted and secondly you will forget what has been told. So the smartest thing you can do in this case is take down all the notes and pay attention to what is being said. You will be helped majorly. Whenever you are at a webinar, do not forget to ask questions. Raise your hand and ask questions when you think you have any doubts in mind. Most of these webinars will give you some kind of instructions from before so you should definitely take up that offer. Getting the sort of advice you have always wanted will always make you feel good. Not just that you will also be taking advantage of the session. So when you are at a webinar, make sure to ask questions. It will always help you for sure. It is important to do some research before you are about to attend a webinar. This can really help you in so many ways. You will know what the webinar is all about and where these people come from. Not only that, you may also have a good idea on what has been organized. Plus there are so many things that you could learn about the speaker so keep a note about that as well. You should know who these people are otherwise you could end up wasting your time. Doing research is very much important. So don’t miss out on it at all. Some of these webinars could have a funny name but none of that means that webinars cannot help you in any way or build your career in the future. Our suggestion to you would be to try and participate in this and ask questions when the need arises. Of course there will not always be a panacea for all the work woes but you should always keep working so that you can keep getting better at what you usually do. On that note, we bring the post to an end. If you have any positive comments or ideas and suggestions, feel free to comment below. We would love to hear from you.